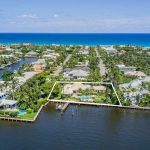 Welcome to “Nautilus”, a resort-style waterfront estate located at 1033 Waterway Lane on Delray Beach’s barrier island. Located three blocks north of Atlantic Avenue at the end of a quiet cul-de-sac, the two story home sits on nearly two-thirds of an acre and boasts 158 feet of direct-Intracoastal waterfront. 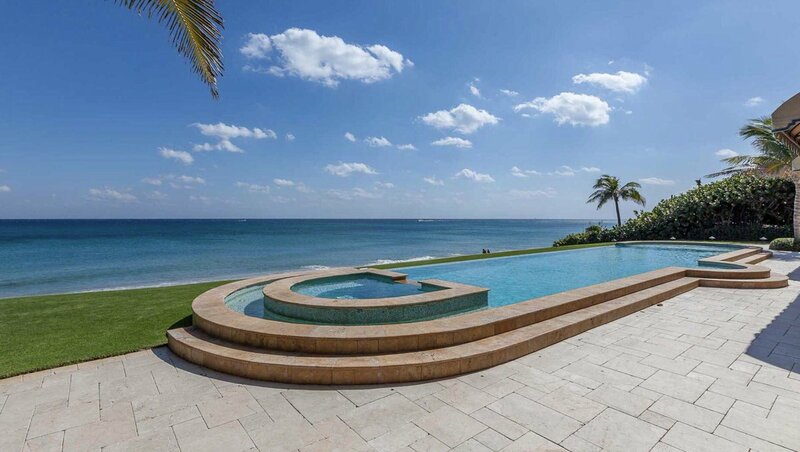 Offering 11,309 total square feet, the six bedroom residence has stunning water views throughout and abundant space for relaxing and entertaining. Tucked away at the end of one of the island’s beautiful streets, the location offers a secluded and private setting with the beach and Delray’s vibrant Atlantic Avenue just blocks away. Travel is easy with several nearby private jetports and three international airports conveniently accessed via Federal Highway or Interstate 95. Yachtsmen and boaters alike will appreciate the private dock with boat lift, air-conditioned equipment storage room and quick access to the ocean via nearby inlets in Boca Raton and Boynton Beach. 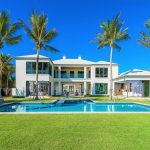 This luxury estate was penned by acclaimed Delray Beach architect Randall Stofft with interior design provided by the world-renowned Marc-Michaels and a no-expense-spared two-year custom-build carried out by Paul Courchene. This ‘trifecta’ of expertise, creativity, and craftsmanship is evident in every last detail of this unique luxury home. The manicured grounds and professional landscape perfectly frame the Chicago brick motor court which leads to the two garages and provides ample parking with a circular drive in the front of the residence. The portico entrance is complete with coral columns and a stately mahogany front door which opens to unveil the home’s interior which is every bit as stunning as the five-star grounds. The foyer has an impressive stairway and marble floors lead to the formal living room with hardwood floors, fireplace and 20 foot floor-to-ceiling bay windows that provide breathtaking water views of the basin and Intracoastal. Adjacent to the living room, the formal dining room has French doors to the pool terrace and a hidden access door to the butler’s pantry. Other first floor features include a 400-bottle climate-controlled wine cellar with security feature; a spacious library/office with game room that is also pre-wired for use as a home theater; powder room; and a large storage closet. The kitchen, breakfast room and family room all overlook the waterway, pool and grounds providing the perfect setting for unparalleled entertaining or quiet nights at home. The large chef’s kitchen offers a granite island, marble counters, snack bar, large breakfast room, walk-in pantry and top-of-the-line appliances including side-by-side Sub-Zero 36” refrigerator & 36” freezer; double electric oven and 48” gas cooktop; Miele espresso machine; two Bosch dishwashers and two Franke sinks. The family room features tongue and groove cathedral ceiling and paneled walls; impressive wet bar and powder room. 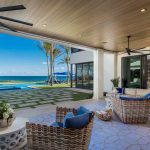 Separating the great room from the lanai, summer kitchen and outdoor fireplace are 22 linear feet of 10 foot tall sliding glass doors that can disappear into the walls to invite the outdoors in, creating a large open area for unparalleled entertaining. From the lanai’s coral arches, remote-controlled “Phantom” screens can be lowered to enclose the lanai when desired. 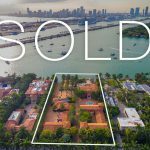 In addition to the main living areas, the floorplan includes six bedrooms, six baths, two half baths and maximizes the unobstructed wide-water views to create a resort-style retreat. A first floor master wing includes bedroom with cathedral ceiling and sitting area overlooking the lagoon pool and spa, his-and-her walk-in closets with dressing area, luxurious master bath with pedestal tub, indoor and outdoor showers, two vanities and two water closets. There is also a secondary master suite on the first floor with shower and whirlpool tub. Upstairs there is a spacious loft with balcony, laundry room and three additional large en suite guest bedrooms, each with a private balcony. The studio-type carriage house is located over the secondary garage accessible by the covered coral breezeway. A kitchenette, walk-in closet and separate entry make it perfect for long-term guests or staff. The service entrance is located off the kitchen hallway with quick access to the main garage, elevator and first floor laundry room. With 158 feet of direct Intracoastal Waterway frontage, the property offers unobstructed water views with a rare basin that sets the property back over 250 feet from the main channel. The five-star grounds are breathtaking and invite endless hours of relaxing poolside or entertaining amidst the water views. The covered lanai features a summer kitchen and outdoor fireplace. The resort-style heated pool includes a spa, infinity edges, fountains, two sun shelfs and sunken seating area. The multi-level terraces perfectly frame the pool and provide ample room for enjoying sunsets or relaxing under the Tiki hut. The private dock is complete with a 20,000 pound boat lift, electric and water. Whether relaxing in the backyard or boating, you’ll appreciate the expansive waterfrontage and setback from the channel. The property has two separate air-conditioned garages. Both are accessed on the north side of the motorcourt and positioned so that none of the four Mahogany garage doors are visible from the street or main entryway. The main house garage includes a 4-post car lift (engineered and ready for a second lift if desired) and a Tesla Supercharger. The secondary garage is accessible from the main house via a covered breezeway and is well-appointed with Baldhead® brand metal cabinets, workbench, distributed audio and additional a/v connections making it ready for an exercise and/or game room. Safety and security features include a perimeter wall and fence; entry gate; 40kw standby generator with automatic transfer switch; fire-rated safe on first floor and hospitality safes in each bedroom’s walk-in closet; video surveillance with network video recorder; a multi-partition security system including outdoor sensors; RFID access control; water leak sensors and even heat/smoke detectors with HVAC-disabling breakers. Nautilus is more than a ‘smart home’ with a long list of state-of-the-art technology that includes structured wiring and equipment racks with multiple Gigabit Ethernet (CAT-5e) runs to each room; enterprise-class networking equipment including router, switches, and wave-2 WiFi; phone/intercom system, gate/door call boxes; planelized lighting system; whole-home audio-visual distribution including streaming audio and movie server; Internet weather-connected irrigation system and integrated swimming pool, spa, and fountain controls – all centrally managed and remotely accessible via the home automation system. LED lighting, high-efficiency HVAC systems, swimming pool heat pump, hot water recirculating system and automation program guarantee this home’s energy use is drastically reduced. Nautilus’ first floor is a full 8 feet above sea level and offers first and second story concrete block construction, poured concrete second story floor and staircase and Pella impact windows and doors. There are four separate attics. Nautilus is truly built to withstand the test of time.